Celebrated at the end of the most sacred Islamic month Ramadan, Eid-ul-Fitr is a three-day long festival that is enthusiastically celebrated by all Muslims of the world. But how did this exciting festival originate? Read this well-researched article from TheHolidaySpot to know about the fascinating history of Eid-ul-Fitr that is related with none other than the great Islamic prophet Muhammad. 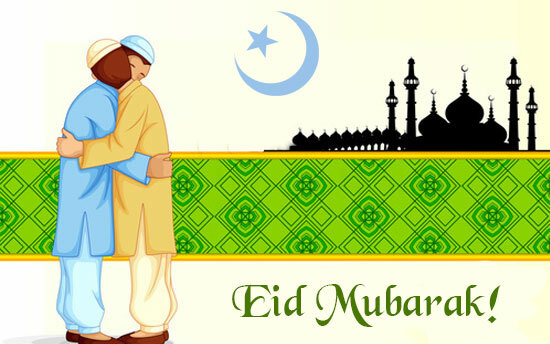 If you enjoy this article on the history of Eid-ul-Fitr and want to share it with your friends and loved ones, just click here and pass on this page to them. Eid-sa-eid to you all! According to the Islamic tradition, it was in the year 610 A.D. that Prophet Muhammad, while meditating in Mount Hira one night during the month of Ramadan, had a vision of the angel Jibril (also known as Gabriel) appearing before him telling his name to Muhammad and declaring to the latter that he was the messenger of God. Jibril said to him : "Iqraa" (meaning "read" or "recite"). To this Muhammad replied that he could not read. Jibril embraced Muhammad and after releasing him repeated: "Iqraa." "I cannot read." Muhammad answered again. "Recite in the name of your Lord Who creates. Creates man from a clot. He teaches man what he does not know." Though the angel informed him that he was the messenger of Allah and was going to be a prophet for his people, Muhammad was greatly disturbed at his meeting with Jibril. It is believed that he at first considered the angel as an evil spirit. It was his wife Khadijah who allayed his fears reminding him of his good conduct until then and that it was impossible for him to be visited by a demon. Even her much learned old cousin Waraqa ibn Nawfal convinced him that he was indeed a messenger of God and the angel who visited Muhammad was the one who had also visited the Hebrew prophet Moses. Muhammad was of forty years of age at this time. In the following twenty-three years, Muhammad was visited many times by Jibril who taught him the holy knowledge in verses. This sacred knowledge consists of the code of conduct that Allah wants his people to maintain on earth. It is inscribed in verses which are compiled in the holy Qur'an, the most sacred book in Islam. It is said that the sacred knowledge was revealed to Muhammad during the month of Ramadan. As a mark of respect to Allah and to show gratitude to him for the true knowledge that he gifted to his sons and daughters, the prophet asked his followers (and therefore the followers of Islam) to pass the month of Ramadan in fasting, prayers and other austerities and end the month-long non-indulgence with festive celebrations. This is how Eid-Ul-Fitr was born. This three-day long celebration ends the ninth month and begins the tenth month of Shawwal with absolute happiness and contentment for the ability to sacrifice for Allah. The aim of this festival is to promote peace, strengthen the feeling of brotherhood and bring oneself back to the normal course of life after a month-long period of self-denial and religious devotion. Malaysia : Hari Raya Puasa/Hari Lebaran. Singapore : Hari Raya Aidilfitri/Hari Otak/Hari Raya Idul Fitri/Hari Raya Puasa. Brunei : Hari Raya Aidilfitri/Hari Otak/Hari Raya Idul Fitri/Hari Raya Puasa.